JINYA Ramen Bar says a portion of proceeds from its opening day will be donated to Montgomery County food bank Manna Food Center. WASHINGTON — Burbank, California-based JINYA Ramen Bar, which claims to have started the ramen revolution in Los Angeles, will open its third Washington-area location Aug. 7 at Pike & Rose in North Bethesda, Maryland. The first 100 customers at its grand opening that starts at 11 a.m. will get a free bowl of ramen. 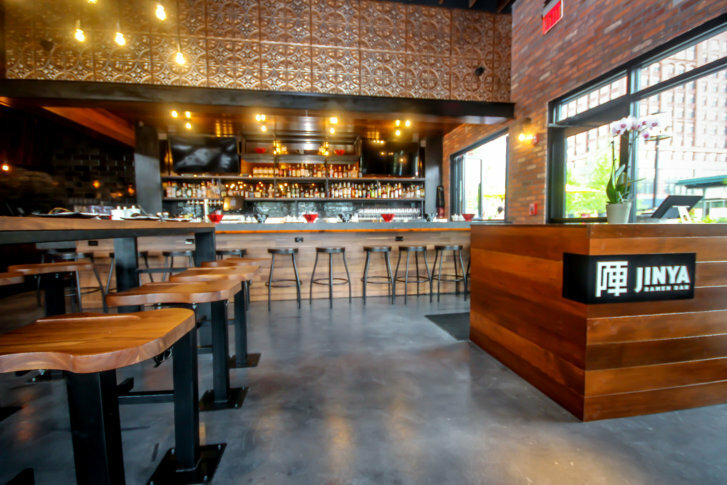 The Pike & Rose location, at 910 Prose St., includes an outdoor patio and fire pit. It will be open from 11 a.m. to 10 p.m. most days, and open until 11 p.m. on Fridays and Saturdays. JINYA opened its first East Coast restaurant at Merrifield’s Mosaic District in Fairfax in 2016, and opened a second Washington-area location on D.C.’s 14th Street last September. It has about 20 locations across the U.S. and Canada. The JINYA menu is available on its website. JINYA joins a long list of restaurants, both fast casual and formal, at Pike & Rose, with more coming. Florida burger chain BurgerFi will open this winter. Annandale, Virginia food hall The Block will open a large, Asian-themed food hall next year. Federal Realty Investment Trust’s Pike & Rose also includes a Canopy Hotel by Hilton, its second Canopy property — the other is at The Wharf. The development also includes several retailers, including L.L. Ban, REI, H & M and an iPic movie theater, four apartment and condominium developments as well as offices.